George Graham Reviews "Jake Armerding"
Bluegrass used to be mainly an instrumental-focussed music. While most of the songs were vocals, the lyrics tended to be based on rural folk songs. But in recent years, thanks to artists like Tim O'Brien and Alison Krauss, the worlds of the articulate singer-songwriter and bluegrass are intersecting a lot more frequently. This week we have another worthy example. It's the impressive national debut recording by a young Boston-area performer, Jake Armerding. Jake Armerding came to bluegrass at a fairly early age -- his father, Taylor Armerding, is a bluegrass player, one of the founders of the acclaimed band Northern Lights. The younger Armerding quickly started out in that direction, and has established a reputation as a multi-instrumentalist, playing fiddle, guitar and mandolin, being known as something of a prodigy. He has appeared instrumentally on recordings by such artists as the Judith Edelman Band, David Wilcox, and his father's band Northern Lights. 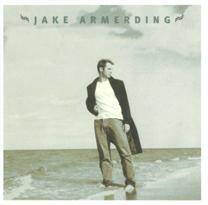 After previously releasing an independent CD with limited distribution, now Armerding is out with the CD also called Jake Armerding, in which he steps out front, vocally as well as instrumentally, with a pleasant high, airy tenor voice. He proves to be a particularly literate songwriter, whose own stylistic influences extend well beyond bluegrass, or for that matter beyond the expected in the singer-songwriter genre. In addition to Armerding's own picking and fiddling, he can also move into the territory of more conventional singer-songwriter fare with a prominent piano and a band that generally includes drums. His lyrics can run from love-songs, to a song based on classical Greek legend, as well as some philosophical reflections. It's all nicely done, and generally quite attractive in sound. Armerding is joined by a regular band including Paul Bessenbacher on piano, Andrew Hall on Dobro, Dennis Holt on drums, Greg Liszt on banjo and Gary Wicks on bass. Also appearing regularly is Jake Armerding's father Taylor on the harmony vocals. While the focus is mainly on the younger Armerding's singing, he also does get in some nice playing on all three of his regular instruments, from the folky guitar to the bluegrassy mandolin and fiddle, to some electrified violin that sounds like a rock guitar solo. Jake Armerding, on his eponymous debut release, carries on a family tradition of bluegrass from his father, who appears on the CD, and combines that with a role as an appealing singer-songwriter, spanning different facets of that style. A talented, literate lyricist, a likable vocalist, and an adept acoustic multi-instrumentalist, Armerding brings all these traits to bear to his new CD. It's a combination that has already been winning new-artist polls in the Boston area, with its already generous supply of good singer-songwriters. Our grade for sound quality is an "A." The acoustic instruments are well-recorded, the pleasing quality of Armerding's vocals shine through, and the dynamic range, while hardly taking the full advantage of all the CD format has to offer, is better than average. There is no shortage of worthy singer-songwriters on the scene these days. With his bluegrass influence, fairly wide stylistic range, and memorable songwriting, Jake Armerding stands a good chance of gaining wider recognition in a crowded field.